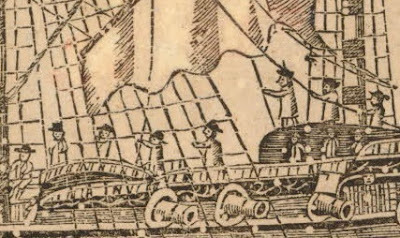 The Famous Ship Victory, artist unknown, 1744, British Museum. Though now lost in the shadow of the more famous ship to bear her name, the Victory was an impressive vessel in her day. 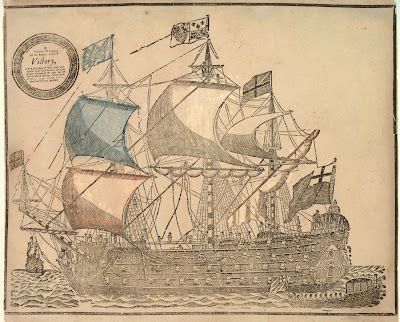 Launched on this day 280 years ago, she was a massive first rate 100 gun ship. Victory was armed entirely with bronze guns, and had a remarkably short career, serving as flagship of the Channel Fleet through the beginning years of the War of Austrian Succession, War of Jenkins Ear, &c.
According to Dr. Frank Howard, in his 1979 Sailing Ships of War: 1400-1860, she was "a high-sided ship for her draught and this was believed to have made her leewardly." Howard suggests this may have led to her loss. On October 4, 1744, the Victory disappeared in a storm along with well over a thousand men, not to be found until 2009. In the wake of this loss, an unknown artist rushed this woodcut to print, capitalizing on the mourning expressed throughout the nation. Aloft and alow the artist populated this piece with some of the sailors and marines dragged to the bottom of the channel. 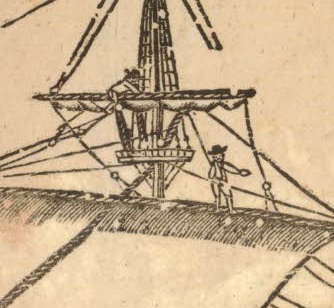 These two on the main topsail and main topgallant wear breeches and a short jacket with round hats with turned up brims on the side. From the poop to the quarter to the gun deck, sailors haul away. They wear jackets and smocks with round hats of various types. Further after on the poop are a passel of officers in cocked hats and coats. Standing to the right is a singular figure with a professional posture, presumably Admiral Sir John Balchen, one of the many casualties of the wreck. In the ratlines are a pair of sailors who appear to be wearing petticoat trousers and jockey style barge caps. Along her larboard quarter rows an impressive barge flying an old, seventeenth century style red or blue ensign. 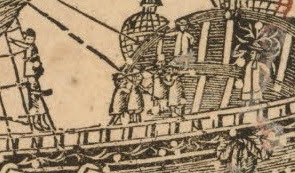 The bargemen and coxswain wear identical round hats and jackets or shirtsleeves.